Q: What meetings industry need does your service fill? 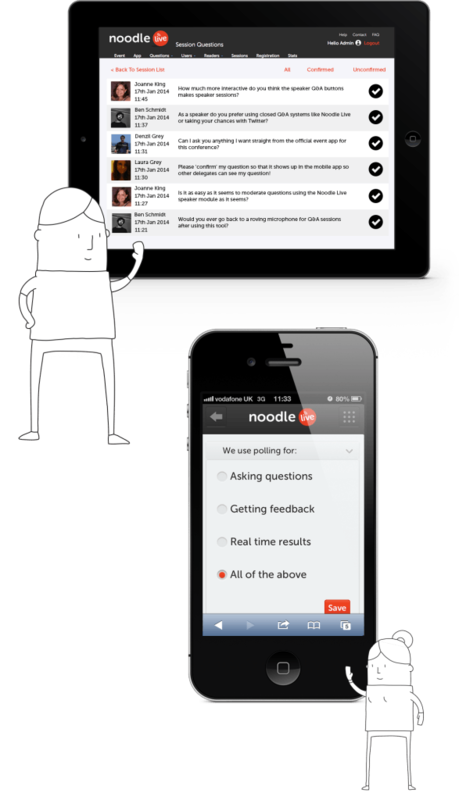 Noodle Live is an event technology company primarily providing mobile apps for events, conferences and exhibitions. We can also integrate RFID smart badges with our app to provide contactless functionality, such as document collection, access control and social sharing. Q: What are your goals for the end of 2014? To keep providing great technology to our clients, keep thinking of new ideas to integrate into our core system and to have a great Christmas party! Q: What do you see the future use of event applications as being? We’re really excited about the potential of NFC, especially now that Apple has integrated this technology into their new iPhones. Alongside this, it’s going to be really interesting to see how the event industry reacts to wearable technology, such as the Apple Watch and Google Glass. Q: In your opinion, why is it critical today and for the future to “Think like a start-up”? This kind of approach really encourages ‘outside the box’ thinking, which for us has always resulted in creative marketing campaigns that make us stand out, rather than wasting money using a more ‘scatter gun’ approach, which is common in Venture Capital funded organisations. Q: What mistakes have you made along the way and what would you change if you could go back? We took too long to move our development in-house and continued using an agency. This is not the most efficient way to produce a system if the technology is your product! Now that we have our development in-house, we are able to develop features much faster and the product itself evolves a lot more organically, as our developers only work on our system and get to know it very well, rather than across several different projects. Q: What will be your biggest challenges over the next three years? Continuing to grow and innovate, making sure we stay ahead of the curve and continuing to advise our clients on the best technology available to make their events more engaging, profitable and successful. 1. Craziest destination: Indonesia. I’ve been several times and it never fails to disappoint, but my first visit as a teenager was definitely the craziest! 3. Hotel to return to: St.Regis in Nusa Dua, Bali – simply beautiful, I wouldn’t mind a dip in the pool there right now. 5. Best Rock band:Too many to choose from! I’m quite a rock chick.